Why choose Alba Game Fishing for your fishing experience in Scotland. Alba Game Fishing is the only fishing company to cover the whole of Scotland. We have a suite of fishing trips and also create bespoke outdoor experiences. Our fishing days are for busy people looking to fulfill a bucket list dream, from the UK or North America, to experience Scotland’s inspiring, educational and spiritual places. In an age where time is precious and traditional experiences have become clichéd. Safety, our guides are trained first aiders and we cut no corners with safety and client care. 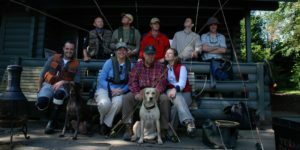 The best Fishing dog any guest could ask for! Call us on (UK +44 7734 810 706 / USA TOLL FREE 800-972-040) or email an enquiry to start planning your fishing experience.